As we invite people to contribute to our GA Gives Campaign this November, we want to remain grounded in what makes L’Arche Atlanta so unique -- the people who make our community as joyful and authentic as it is! We’ll be sharing some of our favorite #FacesofLArcheAtlanta posts, as they allow the people most impacted by L'Arche to share firsthand the impact L’Arche has on them. Becca joined L’Arche Atlanta as a live-in house assistant in June 2017 . We love her peaceful presence, kind heart, and contagious laugh! We asked her a few questions about her experience with L’Arche Atlanta. How did you first hear about L'Arche? What made you decide to become involved with the community? I first heard about L’Arche from a family friend, Judy Miller. She invited me to a dinner at her house during the L’Arche International Gathering in 2012 and I had the opportunity to meet core members and assistants from countries around the world. ​At the time I was still in college and had plans to spend time in the Jesuit Volunteer Corps when I graduated, but that first interaction planted a seed in my mind about L’Arche and life in community. In the spring of 2017 I found myself seeking a change in my work and my lifestyle. As I discerned my next step, my mind kept coming back to L’Arche and those beautiful relationships I had witnessed years ago. The time finally seemed right for me to experience L’Arche firsthand! Terry and Becca find a shady spot to take a stroll at a local park. What is one of your silliest or happiest L'Arche memories? There are SO many, but I think my happiest memory is when our whole community danced at Sarah’s wedding last fall. I will never forget Terry’s face when the Wobble song came on! Despite the rainy weather, our crew danced the night away! L'Arche is all about forming mutually transformative relationships. Can you share a time when you've experienced true friendship while in community? Earlier this spring, my grandfather spent time in the hospital and later passed away. Although this was a very difficult time of loss for me, I was so touched by the way that each of my housemates offered comfort in their own unique ways. John prayed for my family each night and checked in with me often, Terry and Patrick shared their own experiences of loss as a way to connect, Corbin played “Amazing Grace” on his bagpipe chanter, and Tony, Lis, Sarah & Taylor made sure I had space to grieve and the opportunity to be with my family for the funeral. Our house is often characterized by the joy and laughter that we share, but a truly transformative relationship is one that shares in pain and sorrow as well. 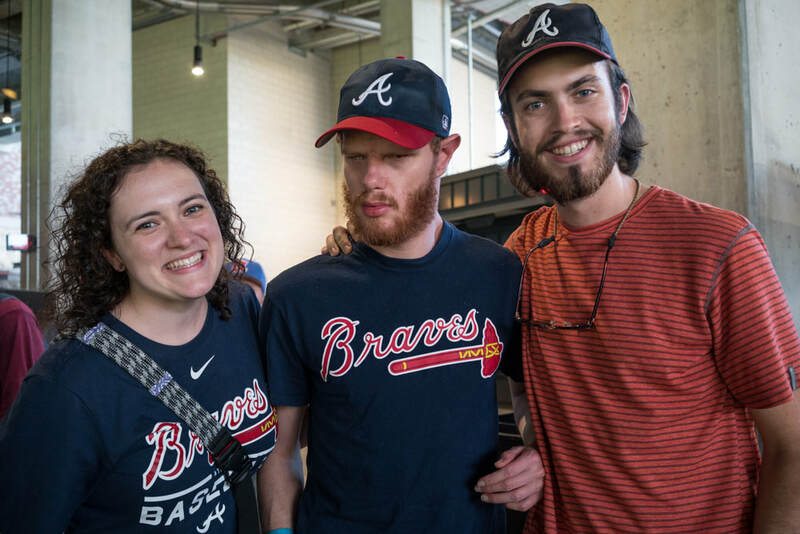 Becca, Corbin, and Taylor had fun cheering on the Atlanta Braves this August. What is one lesson you've learned in your time with L'Arche? In my time at L’Arche I’ve learned the importance of slowing down. I’m a very punctual person and find myself rushing around to get from place to place. L’Arche has taught me to take my time and to stop being so stressed out about “getting there”, which gives me more room to notice the wonderful things that are happening around me. Becca is not only an awesome house assistant, she also manages the L’Arche Atlanta Instagram page! We're so grateful to have her as part of our community! Your gift to L’Arche Atlanta makes ripples through our house, neighborhood, and community, eventually causing a wave of change that transforms society. Will you support the growth of assistants who share their lives with our Core Members with a donation of $25 or more to our GA Gives campaign? A $25 donation might not seem like much, but like a stone tossed into a lake creating larger and larger circles of ripples, it will ripple outward as a powerful testament to what is possible when vulnerable people are moved from the peripheries and placed at the center of our communities.